Revolution speed Stage 1 900 U./min. Revolution speed Stage 2 1.150 U./min. Revolution speed Stage 3 1.350 U./min. Revolution speed Stage 1 600 U./min. Revolution speed Stage 2 900 U./min. Revolution speed Stage 3 1400 U./min. 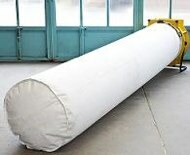 Dust bag attachment to collect and filter dirt and dust particles.